In this readable, exciting, and historically enlightening novel with two separate plots, Audrey Schulman accomplishes an incredible feat. She makes the individual plots totally compelling and uniquely character-driven as they shift back and forth in alternating chapters, always leaving the reader panting for more, anxious to reach the conclusion and a hoped for resolution of the plots. What is most seductive about the novel is that the plots take place in two different time periods and settings—one in Kenya in 1899, and the other, in Virunga National Park, on the border of the Democratic Republic of Congo and Rwanda, in 2000. 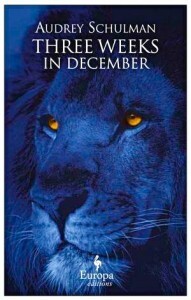 In the first plot a man from Bangor, Maine, responsible for building a railroad from Mombasa to Kisumu must deal with two large and bloodthirsty lions, reportedly over nine feet in length, as they repeatedly attack and kill railroad workers; in the second, a young scientist with Asperger’s Syndrome is responsible for securing a vine, consumed by mountain gorillas, which dramatically reduces the incidence of both stroke and heart disease in their species. 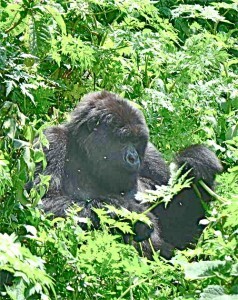 If Max, the researcher is able to obtain samples of the vine, a pharmaceutical company will, among other benefits, provide armed security to ensure the survival of the gorilla population in Virunga National Park. Somehow Schulman manages to connect these two disparate plots in the conclusion, leaving the reader wholly satisfied on several different levels: the two hypnotically revealing stories; the historical insights she provides into the two different time periods and locations; the two uniquely depicted main characters – one a man at the turn of the century who regards himself as “different,” and one a woman of the twenty-first century with Asperger’s Syndrome; and the thematic development which spans an entire century. By setting the novel in Africa, where the human species itself is thought to have evolved from earlier hominids, the author focuses on humanity’s most basic questions – what it means to be truly human and whether humans have a responsibility toward other species and within their own species. 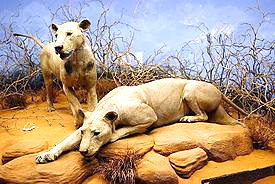 The Tsavo Lions, on display in the Field Museum in Chicago, have been reconstructed from the lions' pelts. Jeremy, a timid graduate of Rensselaer Polytechnic, is plagued by persistent migraine headaches and has long been dominated by his family, and when he has the chance to go to East Africa after experiencing a catastrophic social embarrassment at home in Maine, he jumps at the chance. “This was the land where he would start afresh,” he thinks. In charge of the entire Tsavo River project and over seven hundred men, he is daunted by this plan to build the “lunatic line.” Much of this construction is done in Europe with huge cranes, but the Tsavo job, which he will run, will be done by hand by African natives and imported workers from India, all of whom work cheaper and many of whom will die from natural threats like wild animals, and diseases, especially malaria. When two monster lions begin to attack Jeremy’s men, even as malaria is affecting up to twenty-five percent of the others, the atmosphere of the work camp reaches new lows. The timid Jeremy must pair up with one of the local Africans to try to kill these two lions, who are so powerful that they have managed to kill two people, twenty miles apart, during the same evening. J. H. Patterson with one of the maneless lions, propped up immediately after it was killed. In Rwanda, Dr. Max Tombay is an ethnobotanist with Asperger’s Syndrome, an “Aspie,” as she calls herself. Though she is able to focus very narrowly for long periods of time, she is unable to reach out to others, uncomfortable with interactions involving touch and with face to face conversations, and unable to deal with uncertainties, preferring instead, repetitive tasks which she can do alone. At times lonely to the point of being suicidal, Max has no idea how to achieve the only kind of closeness she can tolerate, since it is so different from the norm. When she accepts the job at the research park made famous by Dian Fossey, she comes into contact for the first time with mountain gorillas, and she (and the reader) discover just how much her way of thinking and her approach to life resemble those of the endangered gorillas. A fictional group of violent rebel soldiers, known here as the Kutu, w hich depends largely on child soldiers, operates out of the Congo and constantly threatens the gorilla population. A drought has caused widespread starvation among the local population, and one massacred silverback gorilla can supply enough meat to serve an entire small village for a week. Max must deal with threats like these as she searches for the mysterious vine, known only to the gorilla population, which could eliminate or reduce strokes and heart disease in the human population. Those who have been to Kenya are probably well familiar with the stories and legends about the Tsavo lions, originally described by Col. John Henry Patterson, the real man who built a railway bridge across the Tsavo River in 1898 – 99. 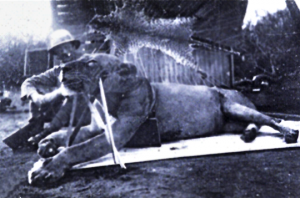 Patterson’s The Maneaters of Tsavo, published in 1907, inspired both Denis Boyles (The Man-Eaters Motel and Other Stops on the Railway to Nowhere, 1991) and Philip Caputo (Ghosts of Tsavo, 2002), who have continued to examine this story of the two enormous, maneless lions who killed an estimated one hundred thirty-five humans. Schulman effectively uses this well-known story to provide an African context in which the introverted Jeremy can face his personal demons, away from his dominating Maine family. The story of Max Tombay, in Rwanda, is equally fascinating, and even more unusual, as Max discovers that her status as an “Aspie” makes her uniquely qualified to understand the gorilla population with which she deals, and she makes the details of Asperger’s Syndrome completely understandable in the context of her story. Though the novel is more a dramatic and beautifully realized adventure novel than it is heavy-duty literary fiction, it is flawlessly organized and executed and is a thrilling book to read. Its unlikely coincidences and the romantic conclusion are just small distractions in this well crafted novel which will keep many readers reading into the early morning hours. 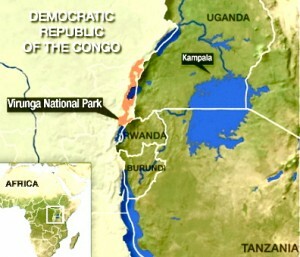 National Geographic has posted an important video about the rebels’ overtaking of the Virunga National Park in October, 2008. http://news.nationalgeographic.com. Attacks continue in this area to the present.